2017. Sanded copper, 46 x 14 x 16 inches. 2017. Polished bronze, 52 x 12 x 12 inches. 2016. Sanded Bronze, 68 x 24 x 14 inches. 2016. Sanded Bronze, 64 x 19 x 38 inches. 2016. Sanded Bronze, 53 x 40 x 16 inches. 2016. Sanded Bronze, 61 x 12 16 inches. 2016. Bronze with blue patina, 58 x 24 x 32 inches. 2016. Sanded Bronze, 68 x 28 x 35 inches. 2013. Bronze, 36 x 24 x 14½ inches. 2013. Polished Bronze, 51½ x 13½ x 17½ inches. 2013. Bronze, 46 x 16 x 13 inches. 2013. Polished Bronze, 38½ x 14 x 15½ inches. 2008. Stainless steel, 72 x 25 x 15 inches. 2008. Sanded stainless steel, 21 x 13 x 5 inches. 2008. Stainless steel, 36 x 34 x 24 inches. 2008. Sanded stainless steel, 21 x 13 x 14 inches. 2008. Sanded stainless steel, 21 x 13 x 12½ inches. 2007. Darkened bronze, 49 x 39½ x 28½ inches. 2007. Bronze, 40 x 36 x 24 inches. 2007. Polished bronze, 22½ x 11 x 8 inches. 2005. Sanded stainless steel, 42½ x 37 x 26 inches. 2005. Bronze with green patina, 38 x 37 x 22 inches. 2005. Bronze with blue patina, 38 x 37 x 22 inches. 2005. Sanded stainless steel, 38 x 38 x 23 inches. 2005. Bronze with blue patina, 52 x 52 x 52 inches. 2005. Darkened bronze, 40 x 12½ x 10 inches. 2005. Bronze with blue patina, 40 x 12½ x 3 inches. 2005. Bronze with blue patina, 14½ x 16½ x 16½ inches. 2005. Bronze painted blue, 41 x 9 x 8 inches. 2004. Bronze with blue patina, 14 x 13 x 13 inches. 2004. Stainless steel, 38 x 21 x 18 inches. 2004. Stainless steel, 37 x 15 x 18 inches. 2004. Stainless steel, 37½ x 15 x 18 inches. 2004. Stainless steel, 34½ x 26 x 18 inches. 2004. Stainless steel, 37 x 36 x 16 inches. 2004. Stainless steel, 40 x 22 x 19 inches. 2004. Stainless steel, 36 x 22 x 18 inches. 2003. Stainless steel, 41 x 16 x 9 inches. 2003. Stainless steel, 39 x 10 x 8 inches. 2003. Stainless steel, 46½ x 12 x 10 inches. 2003. Welded stainless steel. 40¼ x 20 x 15½ inches. 2003. Polished stainless steel, 41 x 40 x 24 inches. 2003. Sanded stainless steel with satin finish, 120 x 88 x 79 inches. 2003. Steel, 13½ x 17 x 17 inches. 2003. Stainless steel 30 x 33 x 32 inches. 2003. Stainless steel, 42½ x 11½ x 11 inches. 2003. 20 x 228 x 144 inches. 2003. Stainless steel, 42½ x 11½ x 16 inches. 2003. Stainless steel, 88 x 124 x 79 inches. 2003. Stainless Steel with mahogany base, 30 x 36 x 36 inches. 2003. Stainless steel, 36 x 34 x 24 inches. 2003. Stainless steel, 48½ x 30½ x 22 inches. 2003. Stainless steel, 87 x 128 x 78 inches. 2003. Stainless steel, 48 x 30 x 22 inches. 2003. Stainless steel painted blue, 66 x 55 x 30 inches. 2003. Stainless steel, 58 x 60 x 32 inches. 2003. Stainless steel, 64 x 56 x 36 inches. 2002. Stainless steel, 42 x 17 x 10 inches. 2002. Stainless steel, 41 x 12 x 8½ inches. 2002. Stainless steel, 42 x 12 x 10 inches. 2002. Stainless steel, 48 x 16 x 10¼ inches. 2002. Stainless steel and wood, 46 x 15 x 10 inches. 2002. Polished stainless steel, 41 x 16 x 10 inches. 2002. Polished stainless steel, 30½ x 54½ x 20 inches. 2002. Stainless steel, 84 x 44 x 36 inches. 2002. Stainless steel, 30 x 40 x 25 inches. 2002. Stainless steel, 31 x 31 18 inches. 2002. Stainless steel, 47 x 31 x 22 inches. 2002. Stainless steel, 40 x 36 x 24 inches. 2002. Bronze, 30 x 14½ x 11 inches. 2002. Stainless Steel painted yellow, 40 x 14 x 13 inches. 2002. Bronze, 40 x 12½ x 12½ inches. 2002. Polished stainless steel, 41½ x 16 x 12½ inches. 2002. Stainless steel painted red, 40 x 10 x 10 inches. 2002. Stainless steel, 41 x 9 x 8 inches. 2002. Stainless steel painted red and blue, 41 x 9 x 8 inches. 2002. Stainless steel painted yellow and green, 41 x 9 x 8 inches. 2002. Stainless steel painted red, 108 x 72 x 36 inches. 2002. Bronze with green patina, 36 x 22 x 16 inches. 2002. Stainless steel painted blue, 40 x 16 x 6 inches. 2002. Bronze, 31½ x 22 x 18 inches. 2002. Polished stainless steel, 41¼ x 8 x 8 inches. 2002. Stainless Steel painted blue, 80 x 30 x 30 inches. 2002. Stainless steel, 31 x 11½ x 10 inches. 2002. Bronze, 80 x 30 x 30 inches. 2002. Stainless steel, 40 x 12 x 6 inches. 2002. Polished stainless steel, 29 x 34 x 17 inches. 2001. Bronze, 40 x 15 x 13 inches. 2001. Polished stainless steel, 40 x 40 x 35 inches. 2001. Polished stainless steel, 39½ x 39½ x 26 inches. 2001. Polished stainless steel wire, 41 x 44 x 33 inches. 2001. Stainless steel, 78 x 40 x 36 inches. 2001. Bronze, 96 x 36 x 36 inches. 2001. 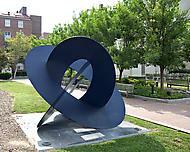 Stainless steel painted dark blue, 50 x 12½ x 12½ inches. 2001. Stainless steel painted green, 49½ x 23 x 22 inches. 2001. Green painted stainless steel. 108 x 35 x 24 inches. 2001. Polished Stainless steel, 35¼ x 11 x 9 inches. 2001. Stainless steel painted blue, 60 x 24 x 24 inches. 2001. Stainless steel, 108 x 76 x 1 inches. 2001. Bronze, 70 x 11 x 10 inches. 2000. Stainless steel, 80 x 36 x 36 inches. 2000. Stainless steel, 31 x 12 x 12 inches. 2000. 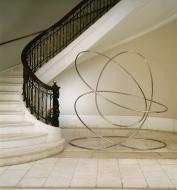 Bronze wire, 30¼ x 17 x 12½ inches. 2000. Spring painted red, 24 x 5 x 5 inches. 2000. Stainless steel, 80 x 80 x 48 inches. 2000. Stainless steel, 31½ x 32 x 20 inches. 2000. Polished stainless steel, 30½ x 30½ x19 inches. 2000. Stainless steel, 30½ x 30½ x 19 inches. 2000. Bronze, 30 x 12 x 12 inches. 2000. Bronze, 30 x 6 x 4 inches. 2000. Stainless steel, 18 x 8 x 8 inches. 2000. Stainless Steel, 40 x 12½ x 10 inches. 2000. Stainless steel, 40 x 12½ x 3 inches. 2000. Stainless steel, 106 x 100 x 54 inches. 2000. Stainless steel, 96 x 59 x 60 inches. 2000. Stainless steel painted blue, (from left to right) 94 x 64 x 24, 104 x 55 x 24, 100 x 36 x 20 inches. 2000. Stainless steel painted blue, (left to right) 101 x 72 x 30, 124 x 54 x 1, 108 x 40 x 1 inches. 2000. Stainless steel, 30½ x1 6 x 13 inches. 2000. Stainless steel 31 x 14 x 12 inches. 1999. Stainless steel and bronze, 360 x 128 x 96 inches. 1999. 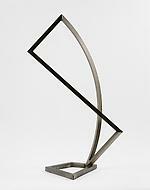 Stainless steel and bronze, 91 x 32 x 24 inches. 1999. Bronze, 82 x 34 x 26 inches. 1999. Bronze, 108 x 40 x 5 inches. 1999. Bronze 144 x 60 x 48 inches. 1999. Aluminum painted red, 96 x 15 x 4 inches. 1999. Bronze, 96 x 60 x 5 inches. 1999. Bronze with blue patina. 144 x 144 x 144 inches. 1999. Bronze with blue patina, 60 x 60 x 60 inches. 1998. Stainless steel painted re and black, 55½ x 10 x 10 inches. 1998. Bronze with carbon black patina, 120 x 64 x 56 inches. 1998. Bronze with dark blue patina, 96 x 40 x 32 inches. 1998. Bronze with carbon black patina, 84 x 72 x 30 inches. 1998. Stainless steel, 84 x 34 x 26 inches. 1998. Stainless steel painted red, 58 x 24 x 18 inches. 1997. Bronze, 72 x 60 x 30 inches. 1997. Aluminum, 96 x 105 x 5 inches. 1997. Darkened bronze, 96 x 105 x 5 inches. 1997. Bronze, 89 x 48 x 31 inches. 1997. Stainless steel, 120 x 40 x 4 inches. 1996. Silver and copper, 15 x 21 x 15 inches. 1996. Painted wood, 15 x 21 x 15 inches. 1995. Granite, 480 x 480 inches.